Only Nintendo would be this crazy. The original Nintendo DSi design had two DS card slots—not SD people, I type good dammit—so it could hold two DS games at once. It was also monstrous. In a session of "Iwata Asks," the DSi's design team reveals how the DSi we know and meh came to be. Originally, they want a swivel camera, but it was too complicated, as was a higher resolution shooter, so we get dual VGA resolution cams. There were a lot of requests among gamers, of course, and from in house as well, for two slots. We also thought that would be good, and, even though we were aware of the drawback of increased size, we decided to proceed with two slots. But when you and your team made an actual model and I held it in my hands, all I could think was, "It's so big!" They almost made it, too, is the really scary part. 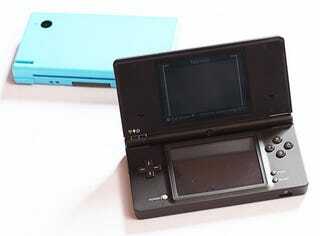 They cut the extra DS slot and redesigned it to be slimmer just before it went to manufacturing.